Major Italian grab manufacturer Negrini Srl has delivered the country’s largest electro-hydraulic orange peel grab. 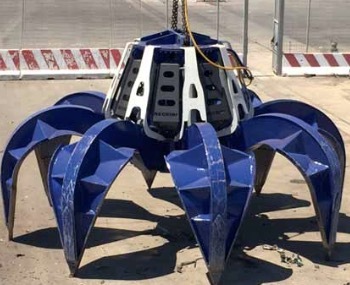 In June 2015, Negrini handed over the technologically advanced grab to Italian company Comap, which will use it to handle scrap metal. Negrini’s acknowledged expertise in equipment for port and shipbuilding facilities enabled it to design and manufacture the very large grab, with outstanding performance. The design stage involved the use of highly advanced software. Negrini’s engineering abilities allowed it to produce structural and electro simulations during the various work phases. techniques. It was then welded by highly trained welder. Of particular note is the ‘heart’ of the grab; this removable electrical system is a new conception, which enables high speed and large forces.